WASHINGTON — Freedom-Woodbridge running back TyQuan Brown is a four-year starter closing in on his fourth consecutive 1,000-yard season. This past Friday night, he enjoyed a career performance and reached another milestone. 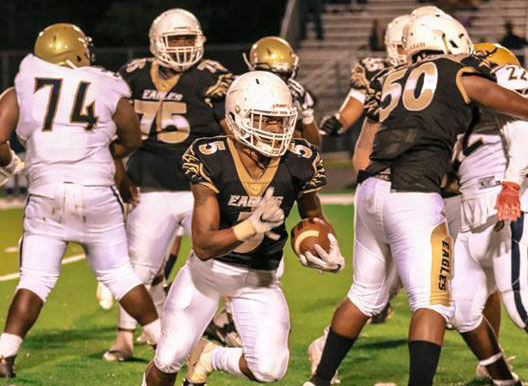 Brown rushed for 331 yards and five touchdowns to lead the Eagles to a 47-13 victory over Hylton, eclipsing the 5,000-yard rushing mark for his career. Brown now ranks third in Prince William County history in yards rushing, trailing only Penn State freshman Ricky Slade and former Woodbridge star De’Antwan Williams. For his efforts, Brown was named the Military Bowl DC Touchdown Club High School Football Player of the Week. It is a simple approach that has allowed Brown to be so successful, according to Freedom Coach Darryl Overton: Brown is patient, runs straight ahead and never loses yardage. Overton said that Brown holds nearly a dozen scholarship offers, including from Maryland and Rutgers. The win over Hylton was satisfying, Overton acknowledged, since the Bulldogs had won the teams’ meeting last postseason after Freedom enjoyed an undefeated regular season. Old Mill QB Markus Thompson passed for 297 yards and five touchdowns as the Patriots beat North County, 47-27. Ballou WR Lavonte Gator caught two touchdown passes, including the game-winning 21-yarder with four seconds left as the Knights rallied to beat Theodore Roosevelt, 29-26. Oakdale WR-DB Luke Carey caught a 35-yard touchdown pass and blocked two punts as the Bears improved to 5-0 with a 44-6 victory over Middletown. Riverside RB Isaiah Bryant rushed for 125 yards and two touchdowns as the Rams beat Dominion, 27-7. Churchill RB Patrick Richardson rushed nine times for 181 yards and five touchdowns and QB Michael Janis completed 10 of 13 passes for 291 yards and two touchdowns in a 62-7 win over Bethesda-Chevy Chase. Falls Church RB Dakwandre Marshall rushed 35 times for 310 yards and six touchdowns as the Jaguars beat Herndon, 41-25. Douglass WR Alajah Dawson had three catches for 106 yards and one touchdown as the Eagles beat Friendly, 38-6. Episcopal RB Junaell Walker rushed 17 times for 198 yards and three touchdowns as the Maroon beat Collegiate, 34-17. Calvert RB Dre Mackall rushed 26 times for 213 yards and five touchdowns as the Cavaliers beat Thomas Stone, 48-20. St. Mary’s Ryken K Garrett Watkins made his second field goal of the game, a 35-yarder, with three seconds left to lift the Knights to a thrilling 34-33 win over Bullis. Watkins also made a 42-yard field goal just before halftime. We’ll see you in Burtonsville, Md. Friday night!